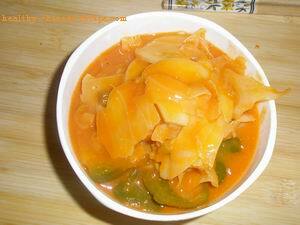 This Nian Gao Recipe is a vegetarian recipe. Many vegetables are added in, including cabbage, bell pepper, tomato, apple, and even navy bean. You don't need to worry about its calories. And it's easy to cook. We know that Nian Gao is varied in different places in China. The nian gao we used here is from Shanghai area which is made from rice powder and glutinous rice powder. Rice is hard and glutinous rice is sticky and soft. When they combine according to a proper ratio, they'll taste soft, tender, and a little al dente. 1. 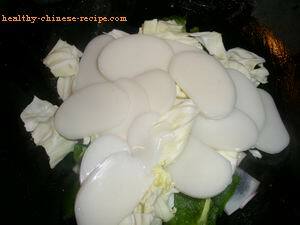 Wash rice cake in hot water. Dice tomato, bell pepper, and apple. 2. Heat oil in a wok, add Sauce, stir fry several times in low heat. Add Seasoning. Stir fry till fragrance comes out. 3. Add cabbage, tomato, bell pepper, apple, and navy bean. Stir fry several times. 4. Add 1 cup of water, rice cake. Mix well, bring to a boil. Simmer till thicken and cooked, about 5 to 8mins. 5. Turn off heat, serve. Rice cake is sticky. Add water whenever it's almost dry. You can replace the Sauce(tomato and miso) with any your favorite sauce in hand.